CAT Undercarriage Parts refers to: drive wheel, guide wheel, support wheel and care sprocket. One refers to the track. They are directly related to the excavator work performance and walking performance, its weight and manufacturing costs accounted for a quarter of the excavator manufacturing costs. The crawler is the weight of the excavator and the work and walking load to the ground. 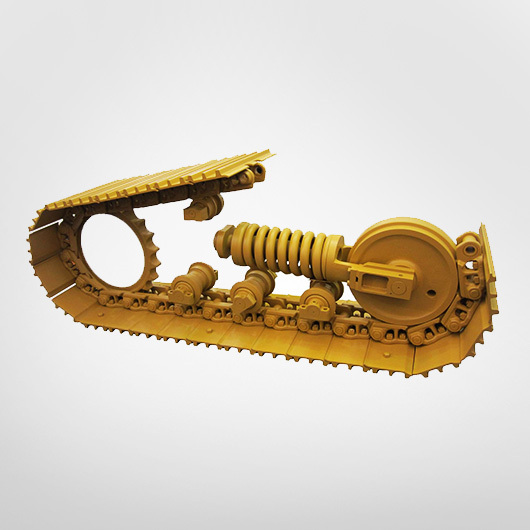 Excavator according to the material can be divided into steel track and rubber track. Steel track wear resistance, easy maintenance, good economy and thus it is widely used. Rubber track is to protect the road from damage, and it is generally used in small hydraulic excavator. Steel track board classification: the overall and modular. The overall crawler track shoe with meshing teeth, the trend and the drive wheel meshing, the track plate itself as a wheel and other wheel rolling track. Its characteristics are: manufacturing convenience, but wear fast. Now the excavator multi-purpose combination, characterized by small pitch, good rotation, excavator walking fast. long lasting. The material of the track shoe is light weight, high strength, simple construction and cheap rolling plate. Rolling plate with a single bar, double bars and three tendons and other materials. Now excavators are used three bars. It has the advantages of a small height of tendons, crawler plate strength, smooth movement and small noise. There are four connecting holes in the track shoe. There are two cleaning holes in the middle, which used to automatically remove the clay. Close to the track between the two parts of the track, adjacent to the two crawler plate made of overlapping parts, to prevent the track between the 10 into a too high tension. In the wetlands of the excavator can be used triangular track shoe, the cross-section of the triangle, can speak soft ground compression, improve the support capacity. The power of the hydraulic excavator engine is transmitted to the track through the travel motor and the drive wheel, requiring the drive wheel to be properly engaged with the track of the track, and the transmission is smooth and flat and can not be well engaged when the track is stretched due to wear and tear "Jump teeth" phenomenon. The drive wheel of the track shoe traveler is usually placed behind. It can not only shorten the length of the track tension section, reduce power loss, but also improve the track life. It can be divided into structure: integral and split. It can be divided according to the pitch: equal pitch and unequal pitch. Material: 50Mn 45SIMN, and its hardness to HRC55-58. The guide wheel is used to guide the track to proper operation. It can prevent its deviation and deviant. Most of the hydraulic million skills to guide the wheel at the same time play the role of the wheel, this way can increase the track contact area on the ground, reducing the specific pressure. Guide wheel rounds are mostly made of smooth, the middle of the shoulder ring for the guide, both sides of the ring can support the role of the chain chain from the wheel, the sides of the slope to be small, guide wheel and the most The smaller the distance between the adjacent rollers, the better the guide wheel performance. Material: more use of 40/50 steel or 35MN, casting, quenching and tempering treatment, hardness HB230-270. Advantages: In order to guide the wheel to play a role and extend its life, the center of the radial hole of the hole to less than or equal to 3MM, the installation should be centered. The role of the wheel is to dig the weight of the excavator to the ground. The excavator will be subjected to ground impact when traveling on uneven roads. Because the heavy load on the heavy wheel, the working conditions are bad, often in the dust, and sometimes soak in the mud, so it requires a good seal. Material: more with 50mn. Tread for quenching, hardness of HRC48 ~ 57, in order to obtain good wear resistance. Features: more use of sliding bearing support. And with a floating oil seal dust. The role is to hold up the track, so that the track has a certain degree of tension.